I feel I should put on record my experience in the Embassy Residence in Dubai. They would seem to indicate that just as the normal desert birds are becoming scarcer (one can now spend some hours surrounded by trees near villages and not see or hear a sign of bird life), so several species formerly known only on the Indian sub-continent will become naturalized in this part of Arabia and perhaps extend out from here, just as the Ring-necked Parakeet has become firmly established as a breeding resident, having started as an escaped pet. There are several reasons for this. Firstly, there is the popularity of caged birds among the Sheikhs and other local residents who can afford to buy them from the souq, the local pet shop, or even from Harrods. Some people bring them directly from Pakistan when they go there on hunting trips. Secondly, there is the greatly increased number of gardens, some of which, like my own, contain Indian trees which flower and fruit almost throughout the year, enabling escaped birds to survive on their normal diet. Thirdly, cages are apt to be less than secure. 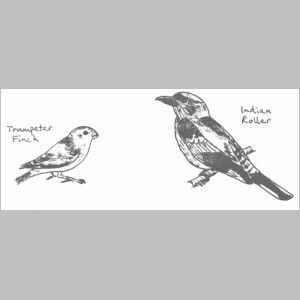 The pet shop sometimes allows its finches to fly around freely in the shop and the zoo has been known to lose anything from cheetahs to chimpanzees, so the cages put up by amateurs in their gardens are likely to be vulnerable. Fourthly, the frequency of the dhow service bringing workers directly from India and Pakistan may allow occasional stowaways to find their way here unintentionally. During three years in Dubai I have seen many unlikely birds in the garden, some of them for a few hours, some for a few days and some (notably the bulbuls) breeding over the years. On more than one occasion, the birds have escaped in pairs and their numbers are certainly on the increase. The majority of those listed below were seen in 1977, and there would appear to be no reason why they should not increasingly find the right circumstances to enable them to breed and eventually become naturalized in some numbers. The only deterrents in the Embassy compound are the frequent passing of helicopters directly overhead, which is apt to frighten away new arrivals. Stray cats stalk and probably catch the more vulnerable birds. On two occasions I have been visited by Jungle Mynahs (Aethiopsar fuscus). In February 1977 I had a brief visit from a single specimen at dusk but was unable to identify it until in November 1977 I had a group of five that I was able to observe in some detail. Like several of my strays, they arrived after stormy weather but only stayed for a few hours. On another occasion (March 1977), I had a large, heavily streaked brown bird, which I tentatively identified as a female Koel, as it seemed both too large and too heavy in the bill for a Brown-phase Cuckoo, the only other possibility I could think of. It kept itself so well concealed in heavy shade that I never got a really good view although it was around for several days. A longer-term visitor was a Drongo, which stayed for about seven weeks in January and February 1977. The tail feather was broken on arrival and I was in some doubt whether it was long and upcurving enough for an Indian King Crow (Dicrurus macrocercus). It obviously likes company and rather pathetically followed the Red-vented Bulbuls around but when they showed no interest it attached itself to a visiting Indian Roller (Coracias benghalensis). I think it was still young as it still showed dark and light brown bars from behind the legs to under the first inch of tail. All the rest was glossy black. Since the summer of 1977 I have had a pair of White-throated Munias (Whistler: Uroloncha malabarica). They are basically an Indian bird (mine are almost certainly of the Indian race with no trace of vermiculation) and I had classified them as escapees until I found that Meinertzhagen in 'Birds of Arabia' mentions that they are not uncommon just outside Muscat, although otherwise found only on the Indian sub-continent. There is also an Arabian race found from the Mecca region southwards to Aden and the Hadramaut. The most beautiful escapee I have had was a Black-headed Canary (Serinus alario). It was so tame that it allowed me to come within a few feet as it sat by a dribbling lawn sprinkler and, though I had no idea what it was at the time, I was able to identify it from the picture in the 'Dictionary of Birds in Colour' which gives it as an Ethiopian bird. The pet shop denied all knowledge of it and I did not hear of anyone who had lost it. For a few hours last spring I had a pair of Java sparrows (Padda oryzivora) and found that the pet shop had a whole cage of them. Less than a week later I saw another similarly red-billed bird with a pale front and symmetrical dark brown and light buff stripes on back and wings, and a loud song. It seemed likely to belong to a species allied to the Java sparrow but I didn't have the necessary reference books to check. In the early summer of 1977 I saw a bird of a most unnatural green which I am convinced was a light-colored sparrow which had been dyed to pass it off as something more exotic. I was therefore suspicious when, a few months later, I saw another bright green bird together with a pink one. However, on closer inspection, the coloring was much subtler, the shape smaller and plumper and the dark bills more like a finch than a sparrow. I have not yet been able to identify them though I had quite a good view of their coloring. One was similar to the pink of a Rosefinch (Carpodacus erythrinus) but without spots, but of a more intense color than a Trumpeter Finch (Rhodopechys githaginea). The other was a bright Parakeet (Psittacula krameri) with green mantle and underparts and dark gray-brown wings and tail. I have tried in the interests of brevity to avoid too much detail but if anyone is interested in knowing more about any of the birds or in querying my identifications, I should be very glad to give fuller descriptions. Nearly all the birds have been seen in the garden immediately around the Residence, as it has the largest number of fruiting trees and a lawn. Trees are still being planted over a wider area of the compound and those planted more recently are starting to fruit so the garden could accommodate large numbers of any bird. It would be interesting to know what the pattern will be in, say, ten years' time. *A hybrid Red-vented/White-cheeked Bulbul has now been seen in the Embassy compound in Abu Dhabi.